Android 8.0 includes binder and hwbinder performance tests for throughput and latency. While many scenarios exist for detecting perceptible performance problems, running such scenarios can be time consuming and results are often unavailable until after a system is integrated. Using the provided performance tests makes it easier to test during development, detect serious problems earlier, and improve user experience. Figure 1. Systrace visualization of binder processes. The four (4) schd-dbg processes are client processes. The four (4) binder processes are server processes (name starts with Binder and ends with a sequence number). A client process is always paired with a server process, which is dedicated to its client. All the client-server process pairs are scheduled independently by kernel concurrently. In CPU 1, the OS kernel executes the client to issue the request. It then uses the same CPU whenever possible to wake up a server process, handle the request, and context switch back after the request is complete. In a perfect transaction, where the client and server process switch seamlessly, throughput and latency tests do not produce substantially different messages. However, when the OS kernel is handling an interrupt request (IRQ) from hardware, waiting for locks, or simply choosing not to handle a message immediately, a latency bubble can form. Figure 2. Latency bubble due to differences in throughput and latency. The throughput test generates a large number of transactions with different payload sizes, providing a good estimation for the regular transaction time (in best case scenarios) and the maximum throughput the binder can achieve. In contrast, the latency test performs no actions on the payload to minimize the regular transaction time. We can use transaction time to estimate the binder overhead, make statistics for the worst case, and calculate the ratio of transactions whose latency meets a specified deadline. Figure 3. Priority inversion in real-time applications. When using Linux Completely Fair Scheduler (CFS) scheduling, a thread always has a chance to run even when other threads have a higher priority. As a result, applications with CFS scheduling handle priority inversion as expected behavior and not as a problem. In cases where the Android framework needs RT scheduling to guarantee the privilege of high priority threads however, priority inversion must be resolved. Figure 4. Priority inversion, blocked real-time threads. To avoid blockages, you can use priority inheritance to temporarily escalate the Binder thread to a RT thread when it services a request from a RT client. Keep in mind that RT scheduling has limited resources and should be used carefully. In a system with n CPUs, the maximum number of current RT threads is also n; additional RT threads might need to wait (and thus miss their deadlines) if all CPUs are taken by other RT threads. To resolve all possible priority inversions, you could use priority inheritance for both binder and hwbinder. However, as binder is widely used across the system, enabling priority inheritance for binder transactions might spam the system with more RT threads than it can service. The throughput test is run against binder/hwbinder transaction throughput. In a system that is not overloaded, latency bubbles are rare and their impact can be eliminated as long as the number of iterations is high enough. The binder throughput test is in system/libhwbinder/vts/performance/Benchmark_binder.cpp. The hwbinder throughput test is in system/libhwbinder/vts/performance/Benchmark.cpp. Time indicates the round trip delay measured in real time. CPU indicates the accumulated time when CPUs are scheduled for the test. Iterations indicates the number of times the test function executed. The latency test measures the time it takes for the client to begin initializing the transaction, switch to the server process for handling, and receive the result. The test also looks for known bad scheduler behaviors that can negatively impact transaction latency, such as a scheduler that does not support priority inheritance or honor the sync flag. 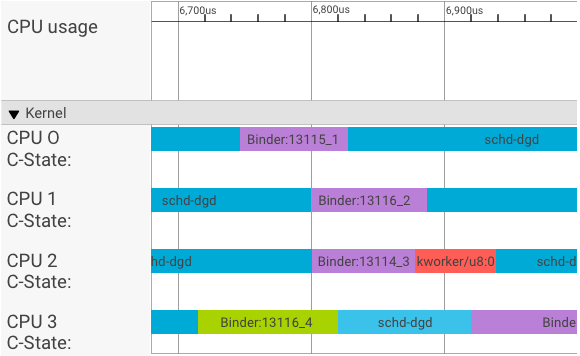 The binder latency test is in frameworks/native/libs/binder/tests/schd-dbg.cpp. The hwbinder latency test is in system/libhwbinder/vts/performance/Latency.cpp. Results (in .json) show statistics for average/best/worst latency and the number of deadlines missed. -i value Specify number of iterations. -pair value Specify the number of process pairs. -deadline_us 2500 Specify the deadline in us. -v Get verbose (debugging) output. -trace Halt the trace on a deadline hit. The following sections detail each option, describe usage, and provide example results. Creates one client and server pair. Deadline is 2500us (2.5ms); most transactions are expected to meet this value. 5000 iterations equals a total of 10000 transactions. 9352 of the transactions are synced in the same CPU. Indicates the ratio at which the client and server are synced together in the same CPU. The average (avg), worst (wst), and the best (bst) case for all transactions issued by a normal priority caller. Two transactions miss the deadline, making the meet ratio (meetR) 0.9996. Similar to other_ms, but for transactions issued by client with rt_fifo priority. It's likely (but not required) that the fifo_ms has a better result than other_ms, with lower avg and wst values and a higher meetR (the difference can be even more significant with load in the background). Note: Background load may impact the throughput result and the other_ms tuple in the latency test. Only the fifo_ms may show similar results as long as the background load has a lower priority than RT-fifo. Each client process is paired with a server process dedicated for the client, and each pair may be scheduled independently to any CPU. However, the CPU migration should not happen during a transaction as long as the SYNC flag is honor. Ensure the system is not overloaded! While high latency in an overloaded system is expected, test results for an overloaded system do not provide useful information. To test a system with higher pressure, use -pair #cpu-1 (or -pair #cpu with caution). Testing using -pair n with n > #cpu overloads the system and generates useless information. After extensive user scenario testing (running the latency test on a qualified product), we determined that 2.5ms is the deadline to meet. For new applications with higher requirements (such as 1000 photos/second), this deadline value will change. The service thread is created with a SCHED_OTHER priority and run in CPU:1 with pid 8674. The first transaction is then started by a fifo-caller. To service this transaction, the hwbinder upgrades the priority of server (pid: 8674 tid: 8676) to be 99 and also marks it with a transient scheduling class (printed as ???). The scheduler then puts the server process in CPU:0 to run and syncs it with the same CPU with its client. The second transaction caller has a SCHED_OTHER priority. The server downgrades itself and services the caller with SCHED_OTHER priority. Android build mode. Eng mode is usually slower than userdebug mode. Framework. How does the framework service use ioctl to config to the binder? Binder driver. Does the driver support fine-grained locking? Does it contain all performance turning patches? 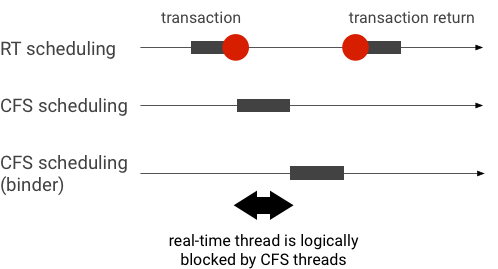 Kernel version. The better real time capability the kernel has, the better the results. Kernel config. Does the kernel config contain DEBUG configs such as DEBUG_PREEMPT and DEBUG_SPIN_LOCK? Kernel scheduler. Does the kernel have an Energy-Aware scheduler (EAS) or Heterogeneous Multi-Processing (HMP) scheduler? Do any kernel drivers (cpu-freq driver, cpu-idle driver, cpu-hotplug, etc.) impact the scheduler?